Guests at the the 'WIZARD OF ODDZ' Halloween Charity Event enjoyed live performances, delicious vegan food tastings, specialty drinks and went home with fabulous silent auction prizes! The 'WIZARD OF ODDZ' Halloween Charity Event, on October 21, 2017, was presented in partnership by UNIVERSEOFÁLI and Vegan Social Events, created by Love Wild Live Free. 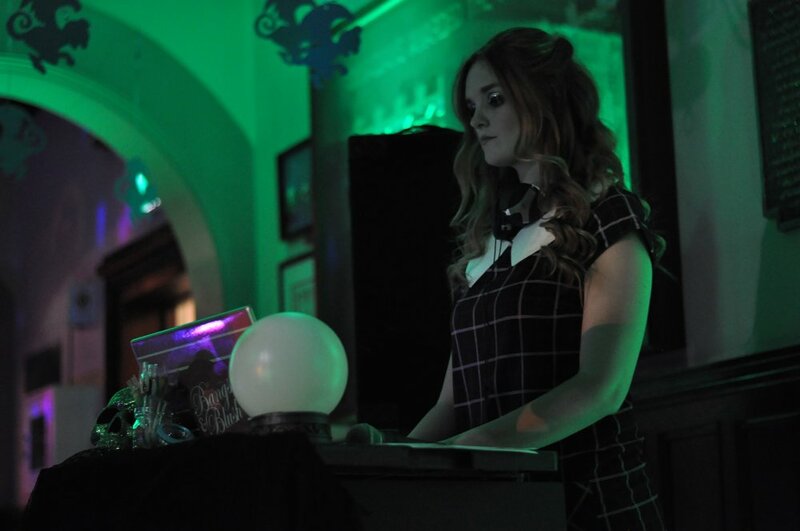 This gala-style, costumed event is Toronto's premier vegan-friendly Halloween party and was the third annual Halloween Event hosted by UNIVERSEOFÁLI. This year the event benefited Story Book Farm Primate Sanctuary, Canada's only Monkey Sanctuary, located in Sunderland, Ontario. The event brought together party-goers from Toronto’s professional and corporate communities, the vegan community, the International and Canadian Military communities and the general public, in a non-judgmental and inclusive space. The evening included a variety of amazing live performers, Wizard of OZ-themed decor with a 'Flying Monkeys' Balloon Raffle with prizes, a 'Yellow Brick Silent Auction', as well as fabulous complimentary vegan food, swag bags, and a 'Poppy Bar' with specialty drinks. We are thrilled to announce that the event raised a TOTAL OF $4,500 for Story Book Farm Primate Sanctuary! It would not have been possible without the support of our wonderful title sponsor Plant Trainers and the generosity of our Food, Swag Bag, Silent Auction and Raffle Sponsors, as well as the outstanding AHOM Food and Bar Staff, the Commissionaires and the photographers and videographers. Special thanks to our amazing volunteers and all of our guests who generously supported the event. We are so appreciative of everyone who was involved including our amazing DJ Candy Warhol from Bangs and Blush who volunteered her time, and our talented performers Sofonda Cox, Coco Framboise and UNIVERSEOFÁLI. The Two Market Girls shared this amazing video recap of the "WIZARD OF ODDZ' Halloween Charity Event! Make sure to subscribe to their YouTube channel for quick and delicious vegan recipes that anyone can make and anyone will love! Photo highlights have been included in this article! You can view the full album on Facebook. Please credit the individual photographers (noted in the description of each photo) when sharing and/or using these photos. Guests journeyed down the yellow brick road to find themselves at the historic and exclusive Armour Heights Officers Mess, Toronto's most secretive estate. Photo by: Two Market Girls. There was no shortage of decor at this Wizard of Oz-Themed event! Photo by: Two Market Girls. Sofonda Cox opened the evening with a very special appearance as the not-so-innocent Dorothy with her gang of outsiders, then broke free to the Queen she is! 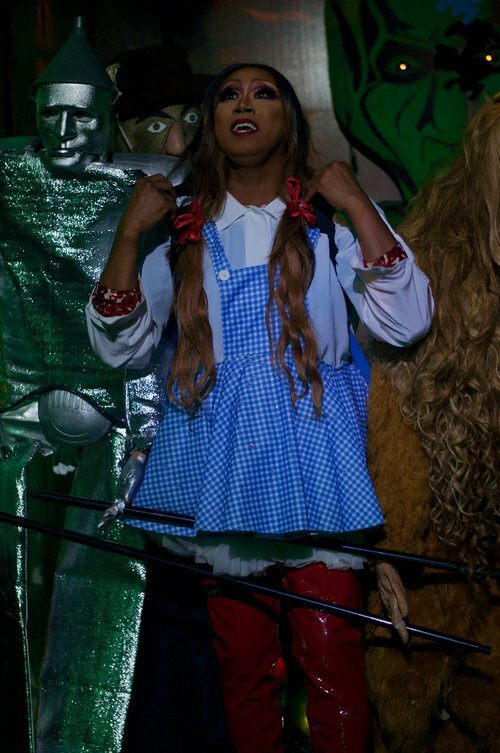 Sofonda Cox as Dorothy. Photo by: Emmanuel Ponce. Sofonda Cox. Photo by: Aaron Fisher. Sofonda Cox. Photo by: Two Market Girls. UNIVERSEOFÁLI was the MC and performed 'Defying Gravity'. Photo by: Emmanuel Ponce. Candy Warhol, from Bangs & Blush, entertained Guests all night long with music from the 50's & 60's!Photo by: Emmanuel Ponce. Coco Framboise created a fantastic and salacious act just for this 'WIZARD OF ODDZ' event! Photo by: Two Market Girls. Story Book Farm Primate Sanctuary is a Canadian registered charitable organization (#84081 7910 RR0001) and is the only Monkey Sanctuary in Canada. Offering 'freedom from fear', it is a place of healing and recovery from trauma. Currently home to 19 Primates, they provide a permanent resident for primates retiring from biomedical research, zoos, universities, and private residences. The sanctuary also advocates for the well-being of exotic animals through education. In sanctuary care, they encourage friendships between residents, exploration and freedom of choice, giving back the ability to make decisions and control events that affect residents' lives. As a 100% volunteer run sanctuary, Story Book Farm does not receive any government funding and relies completely on donations. Feature Guest Speaker Daina Liepa, of Story Book Farm Primate Sanctuary. Photo by: Emmanuel Ponce. Rhesus Macaques, Boo & Gerdie, came from a laboratory in Ontario where they were used as test subjects in neurological research. Photo by: Story Book Farm Primate Sanctuary. Japanese Macaque, Darwin AKA the "IKEA Monkey", was born in Canada as part of the exotic pet trade in 2012, and had lived in a family home in Toronto. He was found in an IKEA parking lot in December 2012 after escaping from his owner's car and was seized by local authorities. A social media and worldwide news sensation, Darwin has resided at SBFPS ever since. Photo by: Story Book Farm Primate Sanctuary. Ring-tailed Lemurs from Story Book Farm Primate Sanctuary. Photo by: Story Book Farm Primate Sanctuary. When Rudy arrived at Story Book Farm, he was emaciated, and his liver was in first stages of shut down. Because he was in poor health, he had lost much of his hair, so he was bald in several areas on his body, and his tail was completely bald except for the very tip. Photo by: Story Book Farm Primate Sanctuary. Cheeko, a Black-tufted Capuchin, lived in a greenhouse in a garden centre in Ontario. He had no outdoor space and little in the way of comforts. Photo by: Story Book Farm Primate Sanctuary. Visit www.storybookmonkeys.org to learn more about the sanctuary and how you can help! Suzi was the most beautiful Glinda EVER! Thank you to Iddy Biddy Fitness Apparel for donating the perfect shirt to stay fit in!Photo by: Aaron Fisher. Ian MacNeily did a fantastic job as the Courageous Lion! Thank you to Plant Trainers for donating their Propelled by Plants t-shirt! Photo by: @PlantTrainers. Look how cute the Two Market Girls are! We're especially loving their use of recycled items! Thank you to Mindful Macarons for donating an amazing prize of yummy Pumpkin Spice macaroons - Vegan of course!Photo by: Aaron Fisher. Panago Pizza, Chic Peas Veg, Vegan Stokes Cheese, Nona Vegan Foods, Culcherd, Kupfert & Kim, Aruna and Kamal Sethi, Sunflower Kitchen, Nuts for Cheese, Laine's Marinades, Ambrosia Natural Foods, WELO, foodora, Yoso, Pixie Mood, Four Sigmatic, Manitoba Harvest Hemp and GoGo Quinoa. Some of the wonderful vegan treats featured in the swag bags. Photo by: Love Wild Live Free. Cheesy nachos by Nona Vegan Foods. Photo by: Aaron Fisher. Yummy Vegan Pizza compliments of Panago Pizza. Photo by: UNIVERSEOFÁLI. Delicious Cheeses compliments of Vegan Stokes Cheese. Photo by: Aaron Fisher. Hummus and salsa by Sunflower Kitchen. Photo by: Aaron Fisher. Fantastic eats by Chic Peas Veg. Photo by: Emmanuel Ponce. All proceeds from the silent action and interactive balloon raffle were donated to Story Book Farm Primate Sanctuary. Kaivegan TV joined the wonderful Wizard of Oddz Halloween event presented by Universe of Ali and Vegan Social Events by Love Wild Live Free, benefitting Story Book Farm Primate Sanctuary. Story Book Farm Primate Sanctuary is a volunteer-based and donation driven facility. Please visit their website to find out how you can support our primate friends. Thank you to everyone who helped make this event a success! A very special thank you goes to these individuals for which this event would not be possible: Kevin Cotten, Suzi Beck, Loay El-Beltagy, Sandra Handler, Jazmin Aron, Daina Liepa, Rachelle Hansen, Margie Fleming, Ana Seara, Susan Butler, Kelly Martinell, Jen Cassey, Michael Codner, Erin O'Brien, Joey Lax-Vanek, Stefanie Zaarur, Stephanie Cooper, Kathryn Langley Hope, Lara Graham, Kim Duong, Benita King, Tehsina Jaffer, Sanya Soomro, Tracy Sherman, Suzanne Boucher, Stephanie Munro, Kim Meehan and Warren Pait.